VATICAN CITY (CNS) — Pope Francis plans to mark the 50th anniversary of the death of St. Pio of Pietrelcina and the 100th anniversary of Padre Pio receiving the stigmata by visiting the famed Italian saint’s hometown and the pediatric oncology ward of the hospital he founded. Pope Francis will travel to Pietrelcina and San Giovanni Rotondo March 17, the Vatican announced. He will arrive in Padre Pio’s hometown early in the morning, pray in the little Chapel of the Stigmata in Piana Romana, a neighborhood just outside the town, and address a gathering of the townspeople before visiting the Capuchin community. Pope Francis is scheduled to take a short helicopter ride to San Giovanni Rotondo, where a young Padre Pio moved in 1916. It was there that he founded the hospital, Casa Sollievo della Sofferenza (House for the Relief of Suffering). After visiting the children receiving treatment for cancer, Pope Francis will celebrate Mass outside the Church of St. Pio of Pietrelcina. 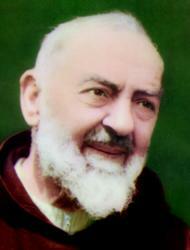 Padre Pio was born in Pietrelcina in 1887. He received the stigmata — wounds on his feet, hands and side corresponding to those Jesus suffered at the crucifixion — in September 1918. He died 50 years later at the age of 81. Pope Francis has praised St. Pio as a devoted confessor, a channel of God’s mercy and a teacher of prayer. During the 2015-16 Year of Mercy, the relics of St. Pio were brought to the Vatican for veneration. “The great river of mercy” that Padre Pio unleashed, Pope Francis told pilgrims, should continue through the prayers and, especially, the willingness to listen and to care for others shown by members of the Padre Pio prayer groups that exist around the world. If prayer were just about finding a little peace of mind or obtaining something specific from God, then it would basically be motivated by selfishness: “I pray to feel good, like I’d take an aspirin,” the pope said.